Park visitors and local school children joined in the celebrations today as the Hyde Park Playground officially opened to the public. Children took part in free drumming and percussion workshops and experienced the new slides, swings and seesaws in a fun packed afternoon of activity supported by the Isis Education Centre team. Known by regular users as the South Carriage Drive Playground, the new Hyde Park Playground has undergone an extensive £390,000 Improvement project and thanks to essential funding from the London Marathon Charitable Trust (LMCT) and AEG Live, will provide young explorers with an exciting and interactive play area for years to come. The largest playground of three in Hyde Park, it is nestled on the southern boundary of the Park between the Serpentine and South Carriage Drive. Its location next to the Serpentine, busy streets of Knightsbridge and public transport make it extremely popular with local, national and international visitors alike. Peaceful tree lined lawns and sweeping views across the Serpentine and towards the Albert Memorial make it a relaxing area much loved by families, schools and community groups. Its popularity was reflected in the old play equipment which, before the refurbishment, had suffered from prolonged and heavy use. Funding from LMCT and AEG Live has been used to enhance the area and provide brand new equipment and interesting landscapes, including a bamboo walkway. 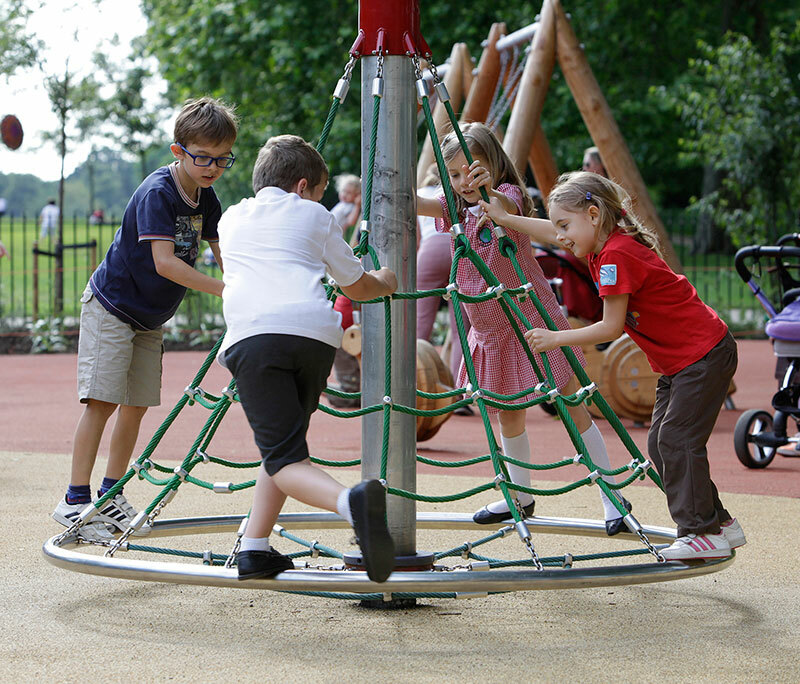 Local schoolchildren and community groups were consulted on their needs and ideas for a new playground by the Royal Parks Foundation. Colin Buttery Director of Parks and Deputy Chief Executive at The Royal Parks, said: "It's wonderful to see children having so much fun. The playground is transformed and is now a space for all the family to enjoy. I'd like to thank AEG Live and London Marathon Charitable Trust for their essential funding which has brought this project to life." AEG Live, who manage and run the Barclaycard presents British Summer Time Hyde Park event with The Royal Parks, has been raising money in a number of ways for projects throughout the park. Colin Chapple AEG Live Chief Operating Officer, said: "AEG are delighted to be able to support the refurbishment of the playground thanks to the contribution of our Barclaycard presents British Summer Time Hyde Park guests. The concept behind the playground matches many of our own event values: it is safe and fully accessible for children with disabilities, the design fits into the natural environment of Hyde Park, most of all it will bring joy into the lives of local families encouraging physical and mental wellbeing." John Disley, President and Race Co-founder, London Marathon, said: "The Trust is delighted to join in partnership with The Royal Parks to ensure these valuable play facilities remain available to all, providing varied and challenging experiences for younger members of the community. We know that one of the first opportunities for exercise open to many children is in a local playground and we are pleased to be making a lasting contribution to the fitness of these youngsters." * retention of the existing trees and new planting within the playground to illustrate seasonality and provide habitat for wildlife.